Bust N/A N/A 39.5" 41" 43"
Length N/A N/A 28" 28" 28"
This pretty cold shoulder mini dress imparts a soft, feminine look that you will love. 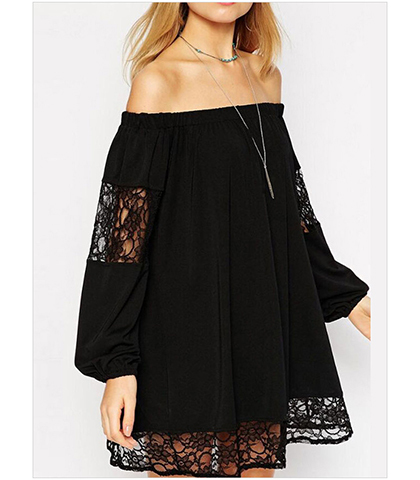 It has a large, elasticized neckline that pulls down, cold shoulder style, to expose the tops of the shoulders. The sleeves are long and full with elastic at the wrists. Panels of lace trim grace each sleeve. The same lace trim appears at the end of the hemline, which reaches the mid-thigh area of the leg. The body of this dress is constructed from soft, high quality velvet. We recommend dry cleaning only for this garment. It is available for purchase in sizes Medium, Large and Extra Large.